From Ferdinand to Frederick, children have wonderful (often animal) picture book role models who express the value in accepting yourself. And of course that message is all well and good. Yet in reality, the self satisfaction found in cherishing your uniqueness sometimes fails to eclipse the loneliness that so often accompanies it. Take Oliver. Here’s a young person who doesn’t seem particularly plagued by the burden of his differentness. He’s not cursing a defect or suffering from taunts; he’s not asking a parent why he is the way he is. He rather enjoys his quiet, imaginative life. His playmates are his toys, plush animals whom he carts around the library and yard. Even surrounded by his boisterous family, Oliver prefers to retreat into his own world with these soft-hearted friends. And with these playful illustrations, the reader may retreat with him. Notice the subtle glances of otherwise button eyes, the teasing suggestion of life from what reason would inform are inanimate objects: a tiny glimpse for us into the everyday magic Oliver experiences. Until one day, it’s not enough for Oliver. His animal friends, heaped in a pile, don’t respond like they used to. Yes, Oliver likes the way he is, and isn’t purposefully ostracized for it. There’s no doubting of self here. 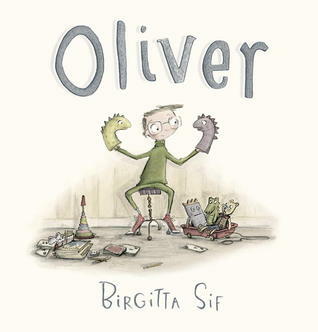 What Oliver lacks is someone who sees the world like he sees it; someone who can appreciate him and share his fantastical world and adventures. By the book’s end and through a fateful moment, Oliver finds his someone: a someone who’s more than plush stuffing and button eyes. And as the reader turns back to pore over the warmly detailed illustrations, she discovers that Oliver’s new friend has been with him all along, present but unseen. More magic lives on these pages, and in Oliver’s world, than first meets the eye. And as Oliver discovers, magic begs to be shared. 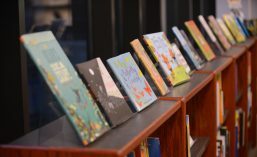 This entry was posted in Candlewick, community, discovery, empathy, identity, Pre-K and tagged picture books. Bookmark the permalink.